No-one appears to have survived a plane crash in eastern Democratic Republic of Congo, the plane's operator says. The Beechcraft plane was carrying 15 passengers and two crew members when it crashed into a mountain near Bukavu, said the operator, Air Serv. The company provides air transport for international aid agencies. Air Serv regional manager Amy Cathey said UN rescue teams were "securing the site and searching for and recovering victims' bodies". US-based Air Serv spokeswoman Suzanne Musgrave told the AP news agency that the plane was being flown by South Africa's Cem Air. 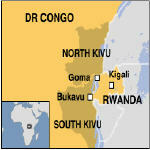 Air Serv said the plane was last contacted in heavy rain 10 minutes from Bukavu. A rescue helicopter was not initially able to land, reports said. It was reported late on Monday that the plane had lost contact with ground control after leaving Kisangani. Many agencies arrange their own air travel for staff in DR Congo because of the country's poor air safety record.